Dolphins are friends of human beings and they look beautiful. Dolphins exist on the earth from 2 crore 50 lakh years. Aristotle is the first person who did research on dolphins. 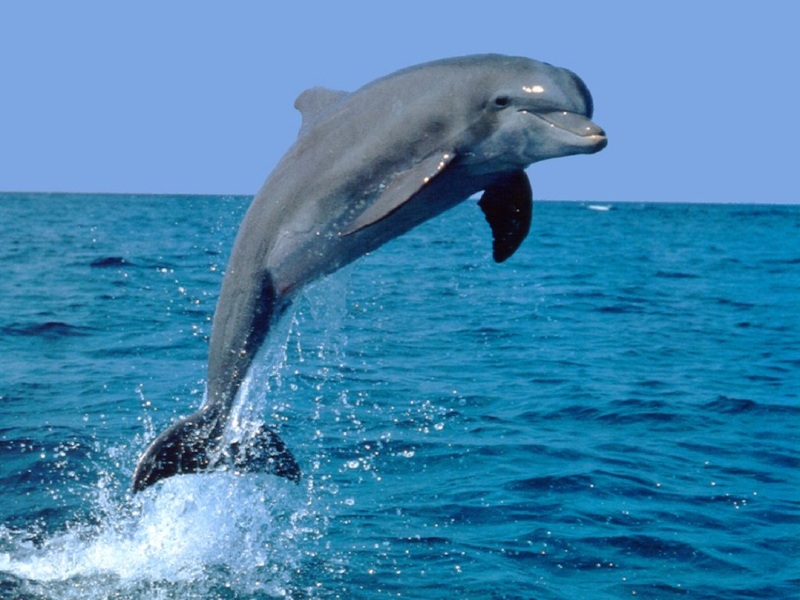 The eye sight dolphin is very powerful and they can see inside and outside the water very clearly. They are having mucus lining around the eyes for protection. The body temperature of the dolphin is near to the temperature of the humans and it is 97.7 o C.
Dolphins are two to three feet long when they are born and baby dolphins drink mother’s milk up to 4 weeks. After that they start eating small fish and adults eat 6 kilos to 22 kilos of fish every day. Dolphins can live for 25 to 40 years. Female Dolphins give birth to the babies for 8 times in their whole life. Dolphins take rest by keeping their heads out of water but they won’t sleep. Dolphins breathe for every 15 minutes when they keep their head in the air. By doing in this way, the respiratory system will be cleaned. Dolphins can stay up to 30 minutes once they take breath which means that the respiratory process is irregular. The hole which is present on head helps in breathing. The brain is very big in the case of dolphins. They also know to do friendship with humans. In the year 2000, when a small boy fell into water and dolphin saved him by bringing out of the water. Scientists had recently found that dolphins are also suffering from type 2 diabetes problem.